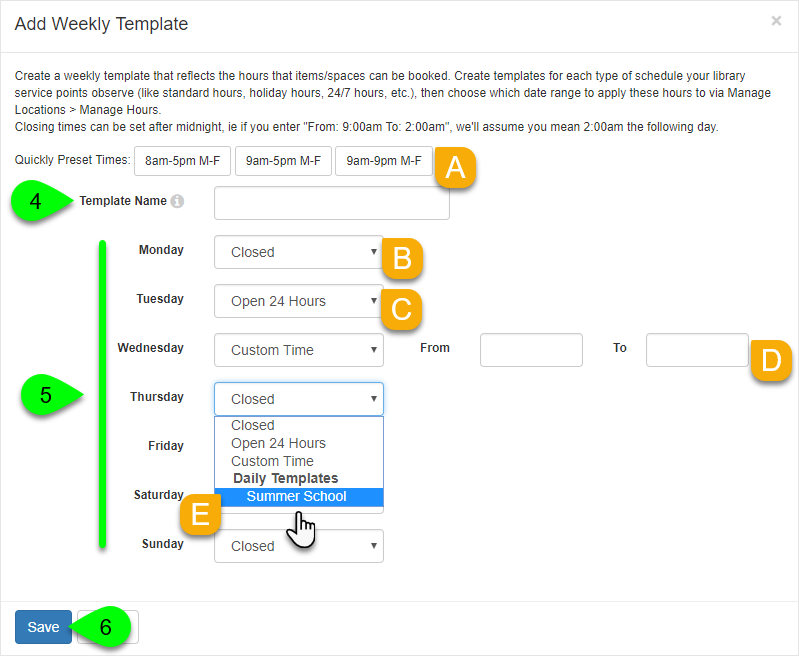 When using custom hours for a location, hours templates define which times of the week your location is open. This will determine the availability times and booking dates for your spaces and equipment. With your weekly hours defined, you would then apply your template to a specific date range (e.g. September 1 through December 15, or something like that). That effectively tells LibCal that spaces and equipment can be booked during those hours between those dates. What should I create templates for? Consider your locations and the hours patrons should be able to reserve spaces and check out items, as well as when those hours vary from the usual schedule. Do any locations have the same hours? For example, if the Main Library & the East Side Library have the same hours for Equipment pick up / return, you only need to create one template for both. Do any of your time periods have the same hours? For example, if the hours for Fall & Spring semester are the same, you can use the same template. Do you have any holidays where the Equipment pick up / return location will have reduced hours? For example, if the library will be closing early for a holiday, you can create a reduced hours template for those days. Click on the Manage Hours Templates tab. Click on the Add New Weekly Template button at the bottom of the Weekly Templates panel. In the Add Weekly Template window, use the Template Name field to give your template a descriptive name. If you are adding hours for multiple libraries and departments, consider using a naming convention that can help you keep these organized. Specify your opening hours for each day of the week. Click on any of the Quickly Preset Times options to apply one of the preset times to your templates. You can then fine tune each day from there. Closed: select this option if you are closed for the entire day. Open 24 Hours: select this option if you are open for the entire day. Custom Time: select this option to display a specific opening time and closing time for that day. Daily Templates: if your system has the K-12 Features enabled, you can create daily templates. These can allow you to set up multiple opening/closing times per day, which can be helpful for creating hours corresponding to class periods. For more info on this, please see the Links & Files section below. Use the Search field to filter the list of templates by keyword. Click on the ID or Template Name column headings to sort by that column. The Hours Preview will show you each template's daily hours. To edit a template's name or hours, click on its edit () icon in the Action column. Any changes you make here will be immediately reflect in all locations, categories, and spaces/items using the template. To delete a template, click on its trash can () icon in the Action column. You can only delete a template if it is not currently in use by any locations, categories, and spaces/items. An alert message will appear letting you know if a template is unable to be deleted. You will need to first remove the template from every location's hours schedules, then try again.